Our FIRST EVER Show on Demonology! 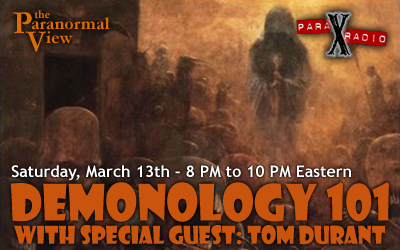 Don’t miss tonight’s special – DEMONOLOGY 101 – with guest Tom Durant! Tom has studied with John Zaffis and offers a fresh perspective on the hot-button topic of demons. This entry was posted on March 13, 2010 at 10:02 am and is filed under Announcements, From the Hosts, Ghosts & Hauntings with tags demonology, demons, excorsism, haunt, john zaffis, Paranormal, posession. You can follow any responses to this entry through the RSS 2.0 feed. You can leave a response, or trackback from your own site.